Biggest Shoes to Fill: DB Kailik Williams his career tied for 11th in program history for all-time career tackles with 240 and forced four takeaways, two fumbles and two interceptions. 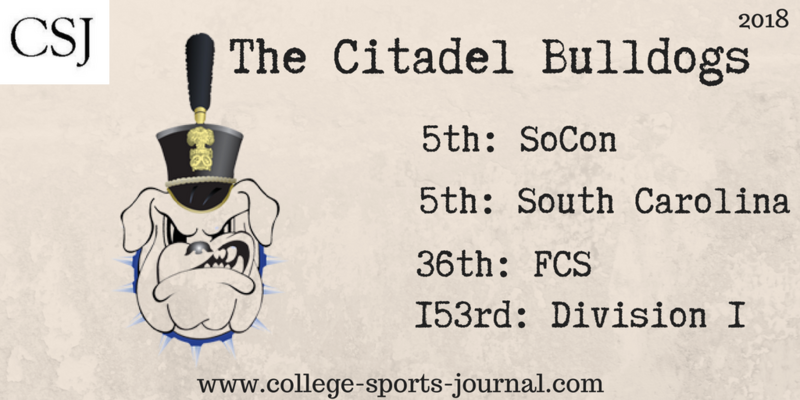 Key Player: Head coach Brent Thompson fielded a lot of freshmen last season, but it’s veteran C Tyler Davis that will be critical to having the Bulldogs’ offensive line gel into a unit that can dominate to allow The Citadel’s option offense to thrive. Last year the Bulldogs averaged a little under 300 yards rushing per game – Davis and the offensive line will have to improve on that number if they hope to compete for a SoCon championship or an FCS Playoff berth. Fearless Prediction: If Thompson’s sophomores, as expected, improve even further this year, this team should compete for the SoCon title deep into November. But they open the season on the road against Wofford, not exactly an ideal spot. Can they upset the Terriers and announce to FCS Nation that they will be a force to be reckoned with this year?